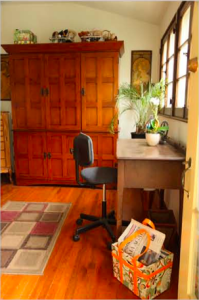 February 2013 | Morgana Rae & Charmed Life Coaching, Inc.
For years now I’ve had a dark secret: my office. I didn’t like it. My Money Honey didn’t like it. I knew I was totally out of integrity. How could I treat my business with such disrespect? Lorwai Tan video interviews me from Down Under in Oz.